We may ride all over India and all 365 days. Because we are honest and wonderful people. We upload beautiful quotes, inspirable quotes, challengeable quotes as our WhatsApp status. We may ride to northern part of India and upload on FB and might get 1000+ likes. But, it shouldn’t be the electronic message on our mobile devices. When there is something special above all these. It should be actionable and meaningful. Giving back to the society which inspires us more than any rides. Would you like to make changes? It’s just needed a helping hand to build our future generation of India. Hence, we thought of start a charity ride towards a government school and help them as much as possible and support those kids for their basic needs. We hope Team Dwichakra will support “Freedom Ride 1.0” and make this ride a grand success than any other riding communities. -Team Dwichakra | Life On 2 Wheels! Free Registartion. Payment is only for donation. 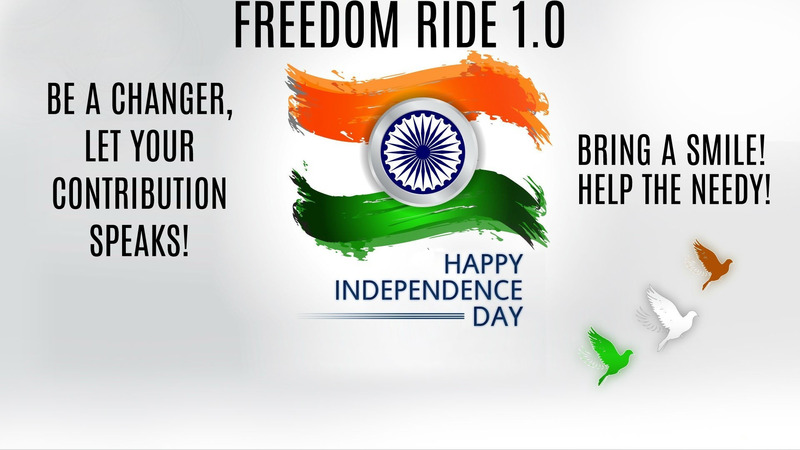 Thank you for registering and part of Freedom Ride 1.0! Welcome to Team Dwichakra. We will get in touch with you shortly. If cancellation is done before two weeks of the ride, then 60% of total amount shall be refunded and transaction charges are applicable. If cancellation is done before a week of the ride, then 40% of total amount shall be refunded and transaction charges are applicable. If cancellation is done within a week of the ride, then there shall be no refunded. If cancellation is done by the Company then 100% of the amount shall be refunded and transaction charges are applicable. If cancellation of charity ride will not have any charges and it's free of registration and donation might apply on riders interest. Our service carries only with minor break down such as puncher, starting trouble, refill fuel and engine oil. Do not over speed or do not leave the camp without prior information. Company (Dwichakra Services Pvt. Ltd.) is not liable for any loss of death or injuries during ride due to riding negligence or under the influence of drugs or alcohol or third party injuries & accidents. Dwichakra shall care for rider in case of medical emergency due to natural consequences such as snake bite or wild animal attack etc. and rider has to wage medical expenses if any.